When I moved to Yuma, Ariz., in 1996, I was the freshest of fresh-meat gringos you’d ever want to meet. Prior to crossing the Mississippi River on my way there, it was my first time ever doing so. I had never been into a western (or really, even Midwestern, state). The farthest west I’d been, I suppose, was the mountains of North Carolina. Or maybe West Virginia. So when I pulled into Yuma, which sits just north of a little notch carved into Mexico and directly adjacent to California, I had a lot to learn about how things were done in my new home. Second lesson, learned two months after my arrival: There is nothing weird about spending Halloween weekend picnicking in the cemetery to honor and celebrate your deceased loved ones. This, I soon learned, was a perfectly normal celebration of Dia de los Muertos, or Day of the Dead. So dear departed uncle Hector loved beans, rice, and tortillas washed down with Tecate with Tejano music playing in the background? Excellent! Cook up a mess of Southwestern soul food and bring the party to him at he gravesite. It’s a family thing. When you think about death and mourning rituals, it all makes perfect sense. But as I was the most gringo of gringos – and had no departed relatives buried within 3,000 miles – I chose instead to adopt little pieces of Day of the Dead to incorporate into my own personal life. The most important was the image of the skeleton performing some typical earth-bound task or profession. 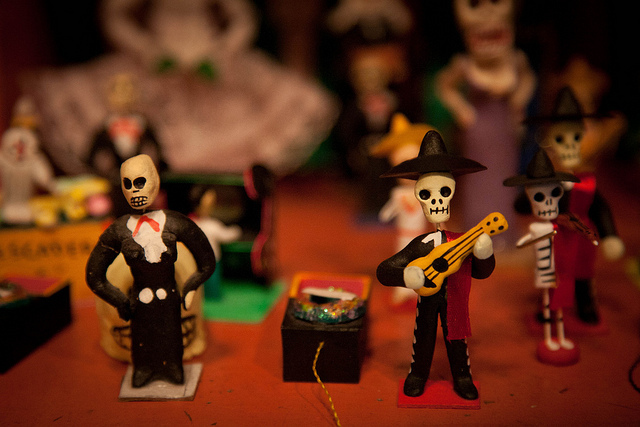 These fantastic folk art figurines are nearly ubiquitous during Day of the Dead celebrations, and I spent a lot of time and energy in nearby Algdones, Mexico, looking for one that represented a writer or journalist. No luck, but I’m still searching, so if you know where I can get one please let me know. At that stage of my life I was single, in a new town and learning not just the ropes of a new region but basically an entirely foreign culture. But because I had a lot of time on my hands outside work, I spent LOTS of it during that period working on the third or fourth draft of Immaculate Deception. One of the images that really kept me on task was – you guessed it – culled from the Day of the Dead tradition. It was a clip-art cutout of a skeleton wearing a vintage biretta – the pom pom-topped headgear worn by some Catholic priests – and holding aloft a hourglass. This picture remained taped to the border of my computer screen for my entire time in Yuma and for many years beyond. The purpose? To remind me that time is short. The Reaper always waits. If you don’t get it done today, there’s no guarantee you’ll have a chance to get it done tomorrow. Reminding yourself of impending death seems like a drastic means of motivation, I know, but I’m convinced that if more of us stepped back and considered that our time on this earth is finite, we’d be motivated to get a lot more done. And more of what we did would be of consequence and value. Previous Previous post: It’s Halloween, Kids … Scary Stuff! Mwuahahahaha … BOO!